Yesterday, the Make-a-Wish foundation and the city of San Francisco brought tears to our eyes by enabling five-year-old Miles to play Batkid for a day. The San Francisco Chronicle got in on the act, printing a Gotham City Chronicle front page for the occasion. 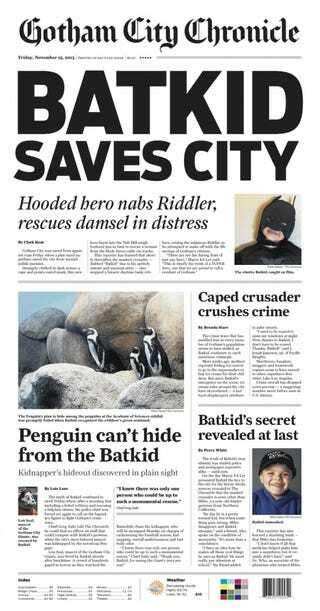 Apparently, the Batkid page was so popular that the Chronicle decided to reproduce it inside the pages of today's Saturday edition of the Chronicle. But they also posted a lower resolution copy of the page online.